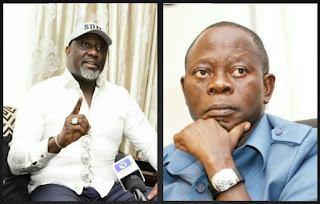 The Senator representing Kogi West Senatorial District, Dino Melaye has slammed the National Chairman of All Progressives Congress (APC), Adams Oshiomhole, over his claim that the seat of the Senate President belongs to the ruling political party, as he pinpointed that the former governor of Edo State is suffering from brain arthritis. The lawmaker added that the seat of the Senate President belongs to the Federal Republic of Nigeria, rather than to the ruling All Progressives Congress. Melaye pointed out that the opposition Peoples Democratic Party (PDP) gave the block vote that made Senator Bukola Saraki emerge as President of the Senate. The lawmaker, who is one of the 14 senators that recently defected from APC to PDP, said this while briefing journalists in Abuja on Sunday. Dino Melaye, however, condemned Oshiomhole for referring to the seat of the Senate President as a ‘crown’ that belongs to the ruling party, APC. According to him, the seat is national and not political.